Five years ago, I moved from Central Illinois to Denver for my job. This means that each year I look forward to travel around Christmastime, in order to allow me to spend the holidays with my extended family. This means we get to live with my parents for a few weeks, and that can makes it challenging to have our own family traditions. Last year, we discussed some things we might be able to do for Advent. The biggest thing that we did was to celebrate St. Nicholas‘s feast day. On the eve of the feast day, we said some special prayers, put a small statue of the bishop Saint Nicholas on our family altar, and read my daughter (who is two and a half) a children’s story about the bishop of Myra. We also had our daughter put out her shoe, she was happy to receive a small gift on his feast day. On Saint Nicholas’s actual feast day, we had a leisurely evening together as a family and said some prayers for Saint Nicholas’s intercession. We also had an extended family meal and made some special punch for the occasion, which our daughter loved. We also added the Magnificat Advent Companion to our prayer rotation and a small, portable Advent wreath so we could count the weeks until we celebrate Christ’s birth. We also spent much of the month of December with friends and family, focusing on having a relaxing, enjoyable and festive season. There are plenty of other websites that have provided a myriad of Advent observances, these are just the ones that worked best for our family this year. If you have a special Advent observance, share it in the comment box. We’d love to hear what other families do to celebrate this very special time of year. The numerals consecrate the new year. 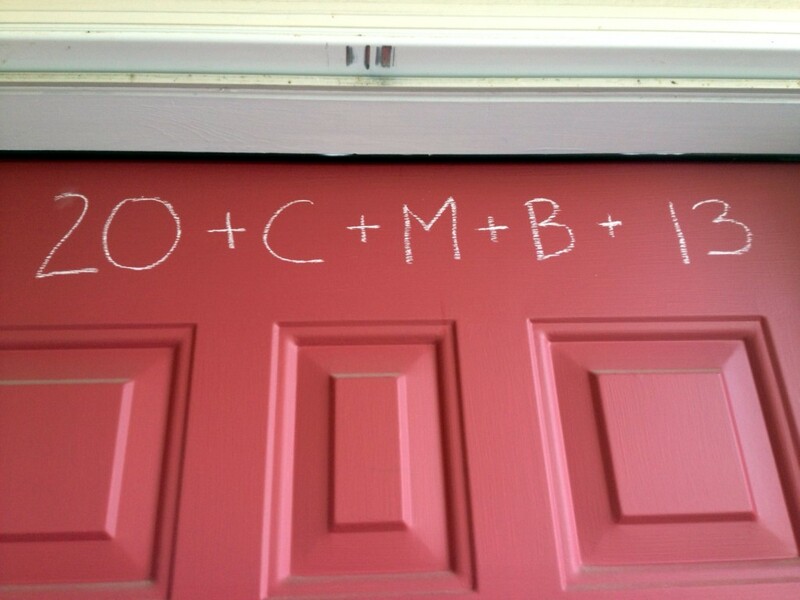 The initials remind us of the legendary names of the magi – Caspar, Melchior, and Balthasar – and also stand for the Latin motto: Christus Mansionem benedicat, which means May Christ bless this house. Lord, as we begin a new year in this home, we ask your protection and seek your guidance as we welcome others into our hearts. May our visitors always find the presence of Jesus in our home especially as we welcome the stranger who seeks to know Christ among us. Bless our home and all who join us. We ask this through Christ our Lord. Amen! I had never heard of this type of blessing before, but I think it’s a nice way to consecrate the home and the new year. After doing some reading, it seems that this is a more traditional observance and more common in Europe. Here is more information via CatholicCulture.org. 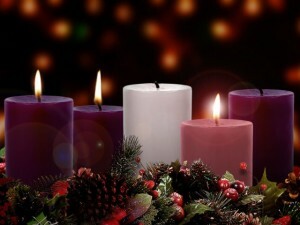 The wonderful season of Advent is well underway! For me, Advent is a time of celebration, hope, and enjoying life while anticipating the celebration of the birth of Our Lord. As I write this article, I am sitting in a quiet house visiting my family in Illinois. I enjoy using the Advent season not only to do the normal “Christmastime” secular activities like buying gifts, but also to refreshing the oft-neglected relationships in my life. I have spent the week catching up with various friends and family members and visiting some of my favorite hometown haunts, remembering the good ol’ days and lamenting how challenging it is to stay in touch give the hustle of modern life. Lately, this has made me consider my priorities in life. After I began writing this article I came across this article at the National Catholic Register outlining an op-ed article that the Holy Father wrote himself suggesting we all do the same. This reflection has led me to one main discussion point: what is my life all about? Ahead of this trip back to my family, one of my cousins asked that I “tone down” the religious conversations because it was too weird last year ad the change that I’ve undergone has been jarring to him. It is clear to him that my life is no longer about idly whiling away evenings drinking beers and throwing darts, not to say that I don’t still enjoy either of those things within reason. But his perception of me is changed, and he has basically asked me to change it back. I wrestled with this conversation for quite some time. On one hand, I am blessed that I have a family member that is so close to me to both see this change and point it out to me. It was very difficult to hear that someone so close to me was upset with these changes that have been occurring in my life. On the other hand, I have no doubt that I have made positive choices over the last few years and my actions reflect my deepening faith in a visible and ultimately good way. This is hard for my friends and family to fully understand, especially for those that preferred my previously cavalier attitude and actions. For Advent this year, I am giving myself the gift of peace. I am choosing to live closer to Christ and the Catholic Church because I believe that this is the best path for me. Ultimately I will have to answer for how I am choosing to live my life and I don’t want to come up short with those answers. I know that many of you wrestle with interpersonal conflict at this time of year, especially when it comes to matters of Faith and family. As our attention turns to celebrating the coming of Christ, I ask you all to heed the Holy Father’s advice and reflect on what the Advent season truly means in your life. I pray that you all have a blessed and happy Christmas celebration this year!